Cost: Varies, depending on materials selected. 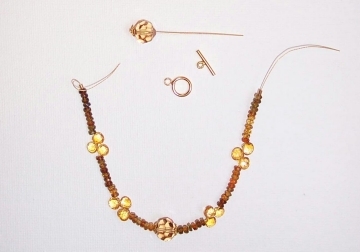 Approximately $40-50 as shown (depends on the quality of genuine tourmaline and citrine beads used). Every now and then I want to make something really special and I am inspired by some of the finer beads that are available. 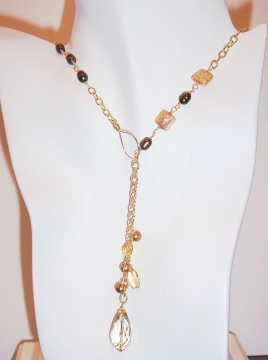 Tourmaline is my all time favorite because it comes in a wide range of colors from pink, to gold and greens, to black. 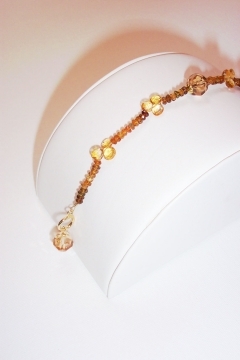 When you want to make something very special, use genuine semi-precious stone beads. 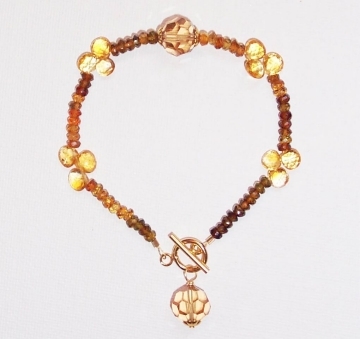 In this bracelet I am featuring sparkling faceted golden tourmaline beads, citrine briolette beads, and two Swarovski crystals as accents. 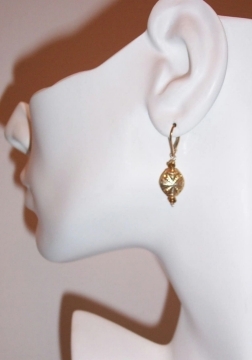 Strung on gold wire with a 14KT gold-filled toggle clasp. 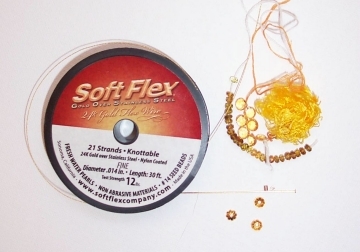 Length of thin gold Soft Flex flexible beading wire (finest gauge) to fit the desired bracelet length, plus a couple extra inches to work with. Tie a knot on one end of the wire, or place some tape over the end, and string all of your beads onto the wire. Check the length and overall design and make adjustments by adding, removing, or re-positioning beads until you are happy with the look of the bracelet. 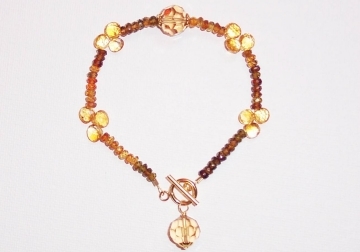 I spaced the crystal bead (with beadcaps) in the center, then evenly spaced the tourmaline and three-bead citrine design along the length of the bracelet. You can do this first on a bead design board if you prefer, but I always like to wrap a bracelet around my wrist just to check the look and fit. Make sure you account for the added length of the clasp. I spaced my beads to end up with a bracelet that was 7 inches long. Slide a crimp bead onto the wire, feed the wire through the clasp loop, then back through the crimp bead. Pull the wire snug, and crimp the bead closed. Follow the How to Use Crimp Beads instructions if you are not familiar with this technique. Repeat on other side, making sure you pull the wire tight to beads before crimping. TIP - Because this is a toggle clasp, you will want to leave a little "play" in the wire so the clasp is easy to put on, so leave a little room where the loop of wire attaches to the clasp. Cut off remaining tails of wire with flush cutters. Slide the bead cap, and crystal onto a head pin. Make a round loop the top, attach to the round part of the toggle clasp so it hangs freely, and close the loop. This bracelet looks great paired with other gold jewelry. Try these additional jewelry projects.